Cleveland and our restaurant, Stancato’s go back a long time. In 1938 when Grandpa Stancato was still a young, single man he started feeding the early risers in the downtown area from a pushcart selling coffee and donuts. It didn’t take long before he and his wife Angela bought their first box truck and named his new business Pat’s Lunch Box. His main account was Republic Steel. He eventually had nineteen trucks going out bright and early each morning serving breakfast and lunch. Years later as his four sons became involved in the business, they added a few ideas of their own. 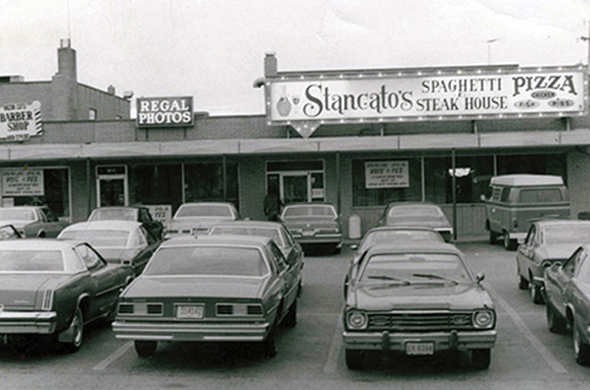 Not straying too far from the food industry, they got involved in various avenues such as Vending, an Office Coffee Service and in 1971 they opened the doors to the time tested Stancato’s Italian Restaurant and Off Premise Catering (originally names Stancato’s Spaghetti and Steak House). And in 1996 when Perry Sr. became the sole owner of Stancato’s Restaurant. One thing always remained the same: Stancato’s commitment to the highest quality food and service. Perry Stancato Sr. and his wife Lorraine, one of the first employees of Stancato’s Restaurant, spent their lives honoring the family tradition begun by Pasquale and Angela. Working seven days a week, they built the restaurant’s stellar reputation: for great food and the kind of hospitality that turns guests into friends and makes Stancato’s Restaurant the place to be. Meanwhile, the couple raised four children of their own: Perry Jr., Meredith, Matthew and Aaron. In May, 2000 Perry Sr was diagnosed with Multiple Myeloma. Sadly, Perry Sr. passed in February of 2001. His legacy lives on, in his name sake Perry Jr., who remembers that the love of food plus the love of people is the recipe for which Stancato’s is most famous. Perry Jr., eldest son, has followed in his Father’s footsteps ever since he was old enough to peddle his way to the restaurant. He started learning the business from the ground up. Graduating from Normandy High School in Culinary Arts he then went on to the Culinary Institute of America. Perry has now taken his college background and is in charge of operations. Frequently guests would comment, “Why don’t you think about bottling these great sauces?”. Perry Jr, who had been running the restaurant under the supervision of his Mother, was sparked by these guests and in 2005 he purchased a bottling facility and called it Signature Sauces. Stancato’s Restaurant now operates 4 kitchens take-out, catering, prepared foods, and the restaurant dining room and offers an entire line of take home pasta sauces, salad dressings, finishing sauces, and our own line of imported custom Italian wines. Signature Sauces is only miles down the road on E. Pleasant Valley Rd. in Independence and manufactures all of Stancato’s pasta sauces, pizza sauce, salad dressings, gourmet finishing Marsala and Piccata sauces, along with private labeling for numerous other customers. In December of 2005, Stancato’s was able to introduce their gourmet pasta sauces to the public with many great reviews. Now you can find Stancato’s Retail Products in over 200 of your favorite grocer locations. We think that every restaurant and entrepreneur should have the same ability to share their passion and sauce with the world. Whether your dining in or at home, every table deserves Stancato’s!